The four are inseparable: Cady, Mirren, Johnny, and Gat, and together, they are the Liars: Three cousins plus one who spend each summer on the family’s private island near Martha’s Vineyard. The Sinclairs are beautiful, strong, smart, rich — an all-American success story. Life is easy, charmed, perfect when you’re a Sinclair. The world is yours for the taking. But there are cracks in this perfect picture, as we learn in We Were Liars. Narrated by Cady (Cadence), we get a peek behind the facade and see the ugliness and lies that permeate the Sinclair family and threaten to ruin the idyllic bliss of summers at Beechwood Island. The four become fast friends, and Gat returns year after year. The Liars are inseparable — but for Cady, it’s much more than friendship, as over the years she falls further and further in love with Gat. But something happens during summer fifteen — something that leaves Cady in a permanent state of suffering, plagued by debilitating migraines and left without any but the barest memory of what happened one eventful night. Her mother won’t tell, and neither will any of the aunts or cousins. The doctors have said that it’s best for Cady to remember on her own — but why? What really happened? We don’t know, and neither does Cady. And that’s about all you’ll get out of me about the plot of this stunning, shocking, unexpectedly evocative book. Really, the less you know up front, the better. Clues pile up, but as we come to learn, Cady’s mind is a dark and twisty place, so that her statements often start off sounding like something to be take literally, only to end in heavily weighted symbolism and metaphor. Then he pulled out a handgun and shot me in the chest. It tasted like salt and failure. The bright red shame of being unloved soaked the grass in front of our house, the bricks of the path, the steps to the porch. My heart spasmed among the peonies like a trout. The language in We Were Liars is extraordinary. From run-of-the-mill to poetic flights of fancy, the narrative swoops up and down, taking us from a description of a simple picnic to scenes of bloody chaos that exist only in Cady’s eyes. What’s real and what isn’t is never quite a simple thing to see, and Cady’s faulty memory is just one piece of the puzzle of what’s really going on with the Sinclairs. Woven into Cady’s stories are tellings and retellings of fairy tales and Shakespeare, and these tales have a hypnotic quality, lulling the reader until the next scene hits us over the head. In each of Cady’s fairy tales, there are princesses and a king, and the tales go in all sorts of unexpected directions, turning traditional stories on their heads and mixing in teen slang and swearing. 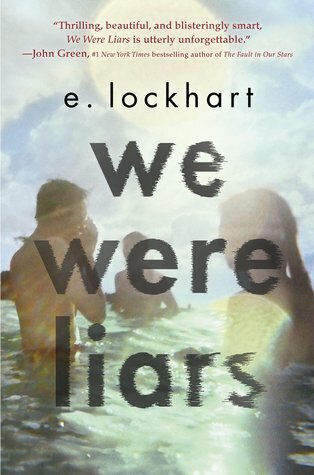 It’s hard to explain just what is so powerful about We Were Liars, but trust me: You want to read this book. Even though I had heard enough to know that I should brace myself for something, I still truly had my breath taken away by the developments and revelations as the plot progressed. So don’t go reading synopses or looking for details ahead of time. Just pick up a copy and find out for yourself! Gah! This one sounds so darn good, I keep hearing the most amazing things about it. I’m really glad that I put this one on hold the other day at the library now I’m just waiting for it to come in. I do trust you and I do want to read this book! Ha ha, thanks for the vote of confidence! I hope you enjoy… let me know! This looks great. Thanks for the stellar review and enticing quotes. Thanks! There were so many passages that I loved! I hope you get a chance to read it. Great review! I keep getting hits looking for spoilers for this book. I really think it’s best to go into it without knowing much.